Tara Farms: His Name Will Be LUKE! 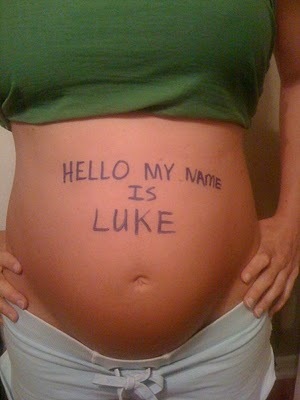 His Name Will Be LUKE! It has been a while since I have posted and the days are quickly passing as we await the birth of our grandson. Several weeks ago Tori & Colin sent us a fun text message that caused a bit of a stir! Teresa, Haley, Paige & I were just finishing ladies Bible study when the text came. As you can see--our grandson has a name. We can't wait to meet Mr. Luke Gardner Bryan! Yesterday we spent the day with Tori & Colin helping get some things done around the house. Our favorite task was working on the nursery. It is turning out so precious! It is still a work in progress but I am posting what we have completed so far. We found these old lockers at the Antique Show in the Spring. Colin & Tori did a great job restoring and painting these! Great grandmother, Memie, painted this old dresser for Luke. All that is missing is the changing pad and this will become his changing table. We still have some more old frames to add to this wall. We are also on a mission to find some old letters to spell Luke's name to fill the existing frame. Troy and Nathan worked on a fence in the backyard for the dog and several other little projects. Poor Colin had to work, but came home and grilled some amazing steaks for the "work crew." It was a special day, made perfect because the entire family was able to share the experience together. Little Luke has an entire family that is already in love with him and anxious for his arrival! Tori will have her first shower in a couple of weeks, Paige & Nathan will be graduating from college....many busy weekends are going to make the days pass quickly until September.